IL-33 administration is associated with facilitation of Th2 responses and cardioprotective properties in rodent models. However, in heart transplantation, the mechanism by which IL-33, signaling through ST2L (the membrane-bound form of ST2), promotes transplant survival is unclear. We report that IL-33 administration, while facilitating Th2 responses, also increases immunoregulatory myeloid cells and CD4+ Foxp3+ regulatory T cells (Tregs) in mice. IL-33 expands functional myeloid-derived suppressor cells, CD11b+ cells that exhibit intermediate (int) levels of Gr-1 and potent T cell suppressive function. Furthermore, IL-33 administration causes an St2-dependent expansion of suppressive CD4+ Foxp3+ Tregs, including an ST2L+ population. IL-33 monotherapy after fully allogeneic mouse heart transplantation resulted in significant graft prolongation associated with increased Th2-type responses and decreased systemic CD8+ IFN-γ+ cells. Also, despite reducing overall CD3+ cell infiltration of the graft, IL-33 administration markedly increased intragraft Foxp3+ cells. Whereas control graft recipients displayed increases in systemic CD11b+ Gr-1hi cells, IL-33–treated recipients exhibited increased CD11b+ Gr-1int cells. Enhanced ST2 expression was observed in the myocardium and endothelium of rejecting allografts, however the therapeutic effect of IL-33 required recipient St2 expression and was dependent on Tregs. These findings reveal a new immunoregulatory property of IL-33. Specifically, in addition to supporting Th2 responses, IL-33 facilitates regulatory cells, particularly functional CD4+ Foxp3+ Tregs that underlie IL-33–mediated cardiac allograft survival. Interleukin-33 is an atypical IL-1 family member that facilitates type 2 responses typified by enhanced Th2 cell activity and the production of type 2-associated cytokines, particularly IL-4, IL-5, and IL-13 in vivo (1, 2). This contrasts to other IL-1 family cytokines, including IL-1β and IL-18, that promote type 1 responses mediated predominantly by Th1 cells and IFN-γ (3, 4). ST2 (also known as IL-1R-like-1), is a TLR/IL-1R superfamily member that, with the IL-1R accessory protein, constitutes the functional IL-33R (1, 5, 6). Like IL-33, ST2 is implicated in type 2 responses (1, 7). It is highly homologous with the IL-1R and exists in two forms, a soluble form (sST2), which acts as an IL-33 decoy receptor, and the signaling transmembrane form, ST2L (8). ST2L is highly expressed on activated Th2 cells (9, 10) and mast cells (11). Functionally, IL-33 acts as a chemoattractant for Th2 cells (12) and drives their production of Th2-associated cytokines (1, 6, 13). IL-33 stimulates both human and mouse mast cells to produce IL-6, IL-8, and IL-13, especially with IgE cross-linking (14, 15). In addition to its influence on mast cells and Th2 cells, IL-33 can promote Th2 responses by supporting the proinflammatory activities of other immune cells expressing ST2L, particularly eosinophils (16, 17) and basophils (18, 19). Recently, ST2L signaling has been found to be critical for expansion of newly identified IL-13–expressing innate immune cells, which are instrumental in Th2-mediated responses to helminths (20, 21). Overall, studies on St2-deficient animals and use of either ST2-specific Ab or sST2 to block IL-33 activity support a role for IL-33 in the facilitation of Th2 responses (2). It is now evident that the immunological activities of IL-33 and ST2L are more diverse than proposed originally. Recently, functional analysis of IL-33–deficient mice has suggested that IL-33 amplifies both Th1 and Th2 responses, particularly by targeting innate immune cells in mucosal tissues (22). Moreover, IL-33 can augment inflammatory cytokine production, particularly TNF-α, IL-1β, and IL-6 by mouse macrophages (23). During sepsis, IL-33 administration does not facilitate a Th1-to-Th2 shift, but reduces systemic proinflammatory cytokines and targets ST2L-expressing neutrophils to facilitate their antibacterial responses (24). In addition, NK cells and NKT cells express ST2L and respond to IL-33 by producing IFN-γ (25). Furthermore, IL-33, highly expressed by epithelial and endothelial cells, may act as an “alarmin,” or endogenous danger signal that, during inflammation and tissue damage, is released to function as a general inflammatory mediator (22, 26). Thus, depending on the environment and cells targeted, IL-33 may act as a potent type 2 signal or generalized proinflammatory signal. Notably, bone marrow (BM)-derived myeloid dendritic cells (mDCs) and endogenous CD11c+ dendritic cells (DCs) also express ST2L, especially when exposed to the antiproliferative/immunosuppressive agent rapamycin (27). IL-33 induces MAPK signaling in BM-derived mDCs (5) and facilitates their support of IL-4 and IL-13 production by Th cells in vitro (28). Mayuzumi et al. (29) reported recently that exogenous IL-33 promotes the generation of CD11c+CD11b+ mDCs in BM cell cultures. DCs from these IL-33–treated cultures were phenotypically and functionally immature and failed to respond to inflammatory stimuli, such as LPS (29). However, the impact of IL-33 on myeloid APC generation and function, especially in vivo, has not been well defined. Although recognized as a potent facilitator of Th2-mediated inflammatory diseases, especially allergic hypersensitivity and arthritis (2, 30, 31), IL-33 also exhibits cardiovascular protective properties. Cardiac hypertrophy after pressure overload is worsened significantly when IL-33 activity is blocked or ST2 is absent (8). Likewise, systemic administration of IL-33 limits cardiovascular disease by inhibiting atherosclerosis development in apolipoprotein E−/− mice (32). Inhibition of atherosclerosis is mediated through the potent instigation of a Th1-to-Th2 switch (32). Recently, IL-33 delivery after experimental cardiac transplantation was shown to promote allograft survival, an effect presumed to result from a Th2 shift in immune reactivity (33). This interpretation would be consistent with past reports suggesting that reduction of Th1 responses by systemic administration of neutralizing IL-12 mAb prolongs allograft survival (34). However, there is also strong evidence that IL-4 and Th2 cytokines can promote graft dysfunction and rejection (35). Thus, the role of ST2 or IL-33 in immune responses to transplanted organs is unclear and warrants further examination. We report the novel observation that IL-33, given to normal or cardiac-transplanted mice, while facilitating Th2 responses also expands suppressive CD4+ Foxp3+ regulatory T cells (Tregs), including a newly identified ST2L+ subset. In addition, our data reveal the ability of IL-33 to modulate both CD11c+ DCs and particularly expand CD11b+ Gr-1+ myeloid-derived suppressor cells (MDSCs). Specifically, IL-33 increases CD11b+ cells expressing intermediate (int) levels of Gr-1 (Gr-1int) that exhibit potent T cell suppressive capacity. Expansion of Tregs and MDSCs depends on recipient expression of St2, but not host mast cells. Likewise, IL-33–mediated prolongation of graft survival requires recipient St2 gene expression and Tregs, but not Gr-1+ cells. As such, these findings establish a new immunomodulatory mechanism, beyond Th2 polarization, and involving Tregs, that underlies the immunosuppressive and heart graft-protective properties of IL-33. Male C57BL/6 (B6; H2Kb), BALB/c (H2Kd), and C3H/HeJ (C3H; H2Kk) mice were purchased from The Jackson Laboratory (Bar Harbor, ME). B6 KitlSl/KitlSl-d mice were kindly provided by Dr. Adriana T. Larregina (Department of Dermatology, University of Pittsburgh). BALB/c St2−/− mice (7) were bred for experimental use at the University of Pittsburgh. B6 Foxp3-IRES-mRFP (FIR) mice (36) were provided by Dr. Fadi Lakkis (Starzl Transplantation Institute and Department of Surgery, University of Pittsburgh). All mice were housed in the specific pathogen-free facility of the University of Pittsburgh School of Medicine with access to food and water ad libitum and used at 8–12 wk of age. Experiments were conducted under an institutional animal care and use committee-approved protocol and in accordance with National Institutes of Health guidelines. Mice were injected i.p. for 10 consecutive days with recombinant mouse IL-33 (0.5 μg/d) or recombinant human fms-like tyrosine kinase-3 ligand [Flt3L; 10 μg/d (37); Amgen, Thousand Oaks, CA]. Recombinant mouse IL-33 was produced as described (12). On day 11, positive selection of CD11c+ cells was performed on spleen cell preparations, as described (27). Splenic Ly6C+ cells or Ly6G+ cells were enriched as reported (38) by positive selection after staining with FITC-conjugated anti-Ly6C (clone no. HK1.4) or PE-conjugated anti-Ly6G (RB6-8C5) and then immunomagnetic purification using anti-PE or FITC microbeads (Miltenyi Biotec, Auburn, CA). BM cells were differentiated from freshly isolated or cryopreserved cells for 8 d in the indicated combinations of recombinant mouse GM-CSF (1000 U/ml; R&D Systems, Minneapolis, MN), recombinant mouse IL-4 (1000 U/ml; R&D Systems), and recombinant mouse IL-33 [25 ng/ml (29)]. Every 2 d, 75% of the culture supernatant was replaced with fresh cytokine-containing media. On day 4, nonadherent cells were discarded. Where indicated, 100 ng/ml TLR-grade LPS from Salmonella minnesota R595 (Enzo Life Sciences, Plymouth Meeting, PA) was added on day 7 for 18 h prior to cell harvesting. Nonadherent cells were then harvested on day 8 and assessed phenotypically by flow cytometry and functionally in MLR. Surface Ag expression by leukocytes was analyzed by flow cytometric analysis as described (5). Briefly, fluorophore-conjugated mAbs obtained from BD Biosciences (San Jose, CA) or eBioscience (San Diego, CA), unless otherwise indicated, were used to stain splenocytes or BM-derived cells for CD3 (17A2), CD4 (L3T4), CD8 (53-6.7), CD11c (HL3), CD11b (M1/70), CD45 (30-F11), CD45R/B220 (RA3-6B2), CD86 (GL-1), F4/80 (BM8), Gr-1 (RB6-8C5), I-A/I-E (M5/114.15.2), Ly6G (1AB), Ly6C (HK1.4), NK1.1 (PK136), or T1/ST2 (DJ8; MD Bioproducts, St. Paul, MN). After surface staining of freshly isolated splenocytes, fixation/permeabilization and intracellular staining with fluorophore-conjugated mAb to Foxp3 (FJK-16a) was also completed where indicated. Where designated, 4- to 5-h stimulation of splenocytes with PMA and ionomycin (Sigma) in the presence of GolgiPlug (BD Biosciences) was followed by surface staining, fixation/permeabilization, and intracellular staining with fluorophore-conjugated mAb to Foxp3, IL-4 (11B11), or IFN-γ (XMG1.4) as described (5, 39). Appropriately conjugated, isotype-matched IgGs served as surface and intracellular staining controls. Data were acquired with an LSR II or LSR Fortessa flow cytometer (BD Biosciences) and analyzed using FlowJo 8.8.6 (Tree Star, Ashland, OR). Total splenocyte numbers were calculated by counting live cells, identified via trypan blue dye exclusion, and then multiplying the number of total live cells by the frequency of the indicated population falling in the appropriate gates, including live cell singlet and overall total live cell gates based off side scatter and forward scatter profiles. Heterotopic (intra-abdominal) heart transplantation was performed with transfer of wild-type (WT) B6 hearts to WT or St2−/− BALB/c mice, as described (39, 40). Briefly, hearts were transplanted into recipients through anastomosis of the donor ascending aorta and pulmonary artery and recipient abdominal aorta and inferior vena cava. Recombinant mouse IL-33 (0.5 μg/d) in PBS or an equal volume of PBS alone was administered i.p. on days 0, 1, 3, 6, 10, 13, 15, and 17. All groups included four to eight mice. Where indicated, WT BALB/c recipients were administered anti-CD25 mAb [PC-61; BioXcell, West Lebanon, NH; 0.5 mg i.p. on day −4 and day 0 (41–43)], anti–Gr-1 mAb (RB6-8C5; BioXcell; 0.5 mg i.v. on days –3, –2, and –1 (44)], or rat IgG isotype control (BioXcell; 0.5 mg i.p. on day −4 and day 0). Graft function was assessed daily by abdominal palpation and rejection defined by the complete cessation of cardiac contraction. Additional transplanted mice (n = 4) were euthanized at day 11 posttransplant and serum, allograft, native heart, and splenocytes harvested and analyzed by Luminex, histological/immunohistological staining, ELISPOT assay, and flow cytometric analysis. Hearts were harvested, bisected, and either embedded and snap frozen in OCT medium (Sakura Finetek USA, Torrance, CA) or fixed in 10% neutral buffered formalin. Formalin-fixed sections were processed, embedded in paraffin wax, and sections cut (5 μm) and stained with H&E or by standard immunohistochemical staining to distinguish CD3+ cells, as described (45). For confocal analysis, OTC-embedded tissue was sectioned (8 μm), adhered to slides, washed in PBS, then fixed in 2% paraformaldehyde in PBS. After washing in PBS, fixed tissue was permeabilized in 0.1% Triton X-100 (Sigma-Aldrich), washed, and blocked with 2% BSA in PBS. Staining was accomplished by first labeling sections with purified rat anti-mouse ST2 (DJ8; MD Bioproducts) and subsequent probing with Cy3-conjugated goat anti-rat IgG (Jackson ImmunoResearch). After overnight blocking with unconjugated goat anti-rat Ab (Jackson ImmunoResearch), sections were stained with polyclonal rabbit anti-Foxp3 (Novus Biologicals, Littleton, CO) then Alexa Fluor 488-conjugated goat anti-rabbit IgG (Molecular Probes/Invitrogen) as a secondary Ab to detect Foxp3. Samples were counterstained with 1% bisbenzamide (Hoechst; Sigma-Aldrich). Optical sections (0.4 μm) were generated using an Olympus FluoView 1000 scanning confocal microscope (Olympus America, Lehigh Valley, PA). Images were all taken with a 40× optical lens (Olympus UPLSAPO; NA = 1.42). The ImageJ program (National Institutes of Health) and Image-based Tool for Counting Nuclei were used to quantitate positive cells in each color channel. In related staining, OCT-embedded samples were cut (4 μm) and multiple staining performed by a sequential avidin biotin method combined with quantum dots (Qdots) (46). Briefly, air-dried slides were fixed with cold acetone then treated with an avidin/biotin blocking solution. Rat anti-ST2 (DJ8; MD Bioproducts) labeling was completed overnight, followed by incubation with anti-rat biotinylated IgG and streptavidin-conjugated Qdot 655 (Invitrogen, Carlsbad, CA). Additional avidin/biotin and serum-free protein blocking was performed before hamster anti-mouse CD31 (2H8; Thermo Fisher Scientific, Pittsburgh, PA) incubation for 1 h at room temperature. After incubation with anti-hamster biotinylated IgG and streptavidin Qdot 705, slides were counterstained with DAPI, dehydrated, and coverslipped. The slides were scanned by Mirax MIDI (3D Histech, Budapest, Hungary) and Qdot specific filters (Omega Optical, Brattleboro, VT). Digital images were captured using Panoramic Viewer (Version 1.14; 3D Histech). BALB/c CD11c+ splenocytes were isolated as described earlier and allogeneic (B6) splenic CD3+ T cells isolated by negative selection completed by cell labeling with rat mAb to mouse CD11b (M1/70), TER-119 (TER-119), I-A/I-E (M5/114.15.2), B220 (RA3-6B2), and Gr-1 (RB6-8C5; all mAbs from BD Biosciences) and removal of bead-bound cells with Mouse Depletion Dynabeads (Dynal Biotech, Oslo, Norway) and magnetic isolation. MLRs were performed using graded numbers of gamma-irradiated (20 Gy) BALB/c CD11c+ cells to stimulate 2 × 105 B6 T cells for 72 h. In a similar fashion, nonadherent cells from B6 BM cell cultures were harvested on day 8, irradiated, and graded numbers used to stimulate 1 × 105 B6 T cells. Over the last 18 h of culture, 1 μCi [3H]thymidine (NEN Life Science Products) was added. After cell harvesting, radioisotope incorporation was determined using a TopCount (PerkinElmer, Waltham, MA) scintillation counter. MDSC suppressor function was ascertained as described (47) with minor modifications. Bulk normal B6 T cell responders were isolated by negative selection as described earlier and 2 × 105 cells stimulated with 2 × 104 gamma-irradiated CD11c+ splenocytes (BALB/c; 20 Gy) alone or with Ly6G- or Ly6C-enriched cells (2 × 105). Ly6G/C cells were isolated from the pooled splenocytes of treated BALB/c mice (n = 2 to 3) as described earlier. Percent suppression is presented and calculated by the equation 1 – [(cpm of T cells + stimulators + Ly6C/G cells)/(cpm of T cells + stimulators alone)] × 100. CD4+ cells from transplanted and naive BALB/c mice were isolated by negative depletion as described earlier, but with the addition of rat anti-mouse CD8α mAb (53-6.7; Becton Dickinson). Purified CD4+ T cells were incubated with CD3-depleted, gamma-irradiated B6, BALB/c, or C3H splenocytes (0.1 × 105 to 1 × 105 T cells + 2.5 × 105 APCs/well) in 96-well nitrocellulose-backed plates (Millipore, Bedford, MA) precoated with anti–IFN-γ, anti–IL-4, or anti–IL-5 mAb (BD Pharmingen). After 3 d, ELISPOT plates were developed by washing the wells and subsequent incubation with biotinylated anti–IFN-γ, anti–IL-4, or anti–IL-5 mAb secondary mAb, streptavidin–HRP, and AEC Substrate Solution (BD Biosciences). The spots were counted using an ELISPOT plate reader (CTL, Cleveland, OH). Serum levels of basic fibroblast growth factor, GM-CSF, IFN-γ, IL-1α, IL-1β, IL-2, IL-4, IL-5, IL-6, IL-10, IL-12(p40/p70), IL-13, IL-17, IFN-γ–induced protein 10 (CXCL10), keratinocyte-derived chemokine, MCP-1 (CCL2), monokine induced by IFN-γ (CXCL9), MIP-1α (CCL3), TNF-α, and VEGF were assessed via the Mouse Cytokine 20-Plex Panel (Invitrogen) and analyzed with a Bio-Plex reader by the University of Pittsburgh Cancer Institute Biomarkers Facility. FIR reporter mice were administered PBS or recombinant mouse IL-33 (0.5 μg/d, i.p., day 0 to day 10) and splenocytes isolated on day 11. After RBC lysis, CD4+ cells were isolated by negative depletion as described earlier. The CD4+ cells were blocked in 10% normal goat serum and then surface stained with allophycocyanin-conjugated Ab to CD4 and FITC–anti-ST2. A Becton Dickinson FACSAria was used for fluorescence detection and cell sorting of CD4+ Foxp3+ (RFP+) ST2L+ or ST2L− cell populations. The capacity of graded numbers of sorted Foxp3+ populations to suppress CD3/CD28-stimulated proliferation was assessed as described (48). 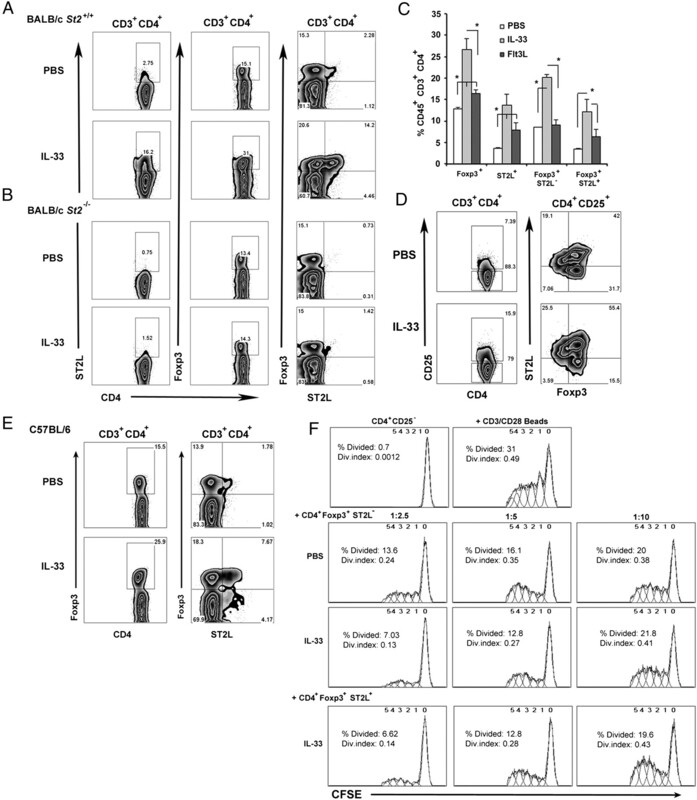 Briefly, 1 × 105 CFSE-labeled B6 CD4+ CD25− effector T cells were stimulated with 5 × 104 anti-CD3/CD28-coated beads (Dynal) in round-bottom, 96-well plates alone or in the presence of varied numbers (1 × 104 to 4 × 104) of sorted Foxp3+ (RFP+) cells. Differences in proliferation of effector T cells after 3-d coculture were determined by flow cytometric analysis and FlowJo software. Results are expressed at means ± 1 SD. The significance of differences between means was determined using Student t test and Prism (GraphPad Software, La Jolla, CA) where p < 0.05 was considered significant. GraphPad Prism 5.0C software package (GraphPad Software) was used to generate survival curves, and the significance of differences in graft survival between groups was determined by Kaplan–Meier analysis and the log-rank test. Given the recent demonstration (29) that addition of IL-33 to mouse BM cell cultures results in the generation of “immature” mDCs that are unresponsive to TLR ligation, we first sought to define the influence of IL-33 on the differentiation and expansion of myeloid APCs in vivo. We examined WT or St2−/− BALB/c mice for modulation of CD11b+ and CD11c+ cell populations after administration of mouse recombinant IL-33 (0.5 μg/d i.p. for 10 d). In addition, we compared the influence of IL-33 on these populations to that of Flt3L (10 μg/d i.p. for 10 d), a potent hematopoietic growth factor that increases CD34+ stem cells and multiple myeloid cell populations, including mDCs in vivo (49). Consistent with the report of Mayuzumi et al. (29), IL-33 administration to WT BALB/c (Fig. 1) and B6 (Supplemental Fig. 1) mice increased the incidence (Fig. 1A, 1C, Supplemental Fig. 1) and absolute numbers (Fig. 1C) of CD11blo CD11c+ cells, but not CD11b+ CD11c+ cells. CD11blo CD11c+ cells in IL-33–treated mice were phenotypically less mature than corresponding populations from PBS- or Flt3L-treated mice (Fig. 1D). Consistent with this finding, purified CD11c+ splenocytes from IL-33–treated mice were poorer stimulators of normal allogeneic CD3+ T cells than those from PBS-treated animals (data not shown). These data are consistent with the capacity of IL-33 to promote the generation of poorly stimulatory CD11c+ cells in vitro (29). IL-33 promotes the expansion of CD11blo CD11c+ MHClo and CD11b+ Gr-1int cells in vivo. WT (St2+/+; A) or St2−/− BALB/c (B) mice were given IL-33 (0.5 μg/d) or Flt3L (10 μg/d) i.p. for 10 d (day 0 to day 10). On day 11, total splenocytes were isolated, stained as described in Materials and Methods, and analyzed by flow cytometric analysis. A and B, St2-dependent increase in CD11blo CD11c+ and CD11b+ Gr-1int splenocytes after IL-33 administration. In A and B, data represent CD45+-gated (left panels) or CD45+ CD11b+ CD11c−-gated (right panels) cells from WT BALB/c St2+/+ (A) or St2−/− (B) mice, and numbers on dot plots indicate percentage of gated cells. Data are from one experiment representative of three performed and depict one animal representative of the indicated treatment group. C, Mean incidence (top panels) for the indicated populations calculated across three independent experiments (n = 7 to 9 per group). Total splenic numbers (bottom panels) for the indicated populations from one experiment representative of the three independent experiments preformed (n = 2 to 3 per group). Error bars indicate 1 SD. *p < 0.05 (Student t test). D, Decreased MHC class II and CD86 on CD11c+ and CD11b+ cells from mice treated with IL-33 or Flt3L. Freshly isolated total splenocytes were assessed for CD86 and MHC class II (I-Ad/I-Ed). Shaded histogram depicts isotype control. Data depict one experiment representative of three experiments performed. We also observed a profound increase in CD11b+ CD11c− cells in response to IL-33 administration (Fig. 1A, Supplemental Fig. 1). 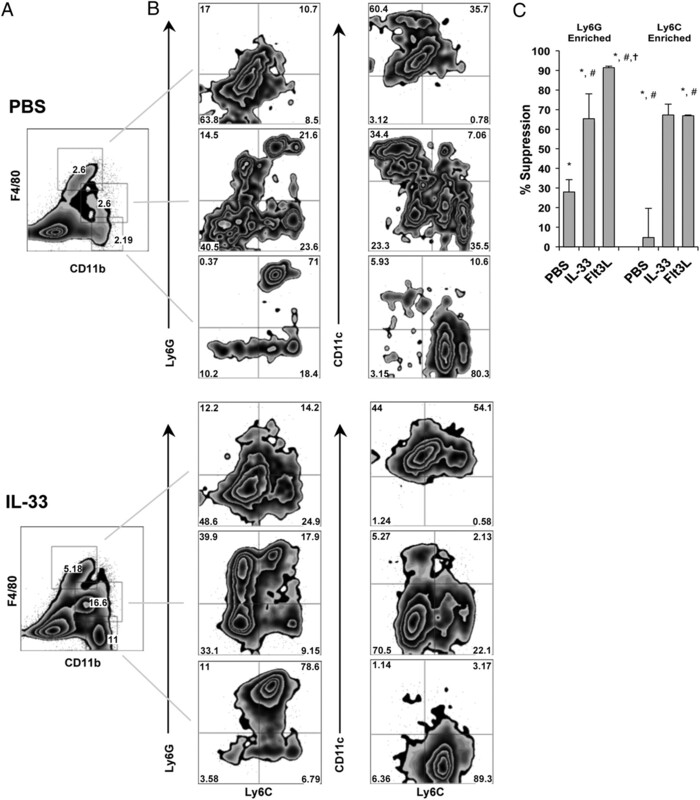 Expansion of CD11b+ CD11c− cells by IL-33 was observed in both B6 and BALB/c mice and was dependent on St2 gene expression as it was not observed in St2−/− mice (Fig. 1B). However, lack of St2 did not result in global defects in myeloid lineage cell expansion, as Flt3L treatment of St2−/− mice facilitated the expansion of CD11blo CD11c+, CD11b+ CD11c+, CD11b + CD11c−, and CD11b+ Gr-1(Ly6C/Ly6G)+ cells (Fig. 1B). Notably, although IL-33 and Flt3L elicited a similar increase in frequency and overall number of CD11b+ cells (Fig. 1A, 1C), IL-33 preferentially increased CD11b+ Gr-1int cells, whereas Flt3L selectively augmented CD11b+ Gr-1hi cells in both WT mice (Fig. 1A) and St2−/− mice (Fig. 1B). The promotion of CD11b+ Gr-1int cells by IL-33 did not require mast cells, which constitutively express high levels of ST2L (Supplemental Fig. 1). Specifically, after IL-33 treatment of KitlSl/KitlSl-d mice that lack skin and tissue mast cells (50), the increased incidence of CD11b+ Gr-1int cells remained prominent (Supplemental Fig. 1). In vitro, we replicated the reported (29) capacity of IL-33 to facilitate the generation of immature (MHC IIlo CD86lo) CD11b+ CD11c+ mDCs that resist TLR4 ligation-induced maturation (Supplemental Fig. 2A, 2B). Addition of IL-33 together with GM-CSF and IL-4 to BM cell cultures also resulted in immature, maturation-resistant mDCs (Supplemental Fig. 2). mDCs from both IL-33 alone or IL-33 plus GM-CSF and IL-4 culture conditions did not upregulate surface CD86 after exposure to LPS (Supplemental Fig. 2B). Likewise, cells generated in IL-33–containing cultures exhibited poor T cell allostimulatory capacity, both before and after stimulation with LPS (Supplemental Fig. 2C). Notably, and similar to our in vivo observations, CD11b+ CD11c− Gr-1+ cells were increased in BM cell cultures exposed to IL-33 (Supplemental Fig. 2A). Thus, both in vitro and in vivo, IL-33 promoted the expansion of CD11blo CD11c+ cells that were phenotypically immature and poorly stimulatory. In addition, IL-33 enhanced CD11b+ Gr-1+ cells. As we observed a significant increase in CD11b+ Gr-1+ cells concordant with an increase in poorly stimulatory CD11c+ cells, we hypothesized that IL-33 might also increase the generation of MDSCs in vivo. MDSCs are a rare, heterogenous population of incompletely differentiated, immature myeloid and myeloid progenitor cells (reviewed in Refs. 51–53). Although heterogenous, MDSCs are globally defined as CD11b+ Gr-1+. The Gr-1 epitope is shared by both the cell surface glycoproteins Ly6C and Ly6G, and at least two subpopulations of MDSCs are recognized and defined by their levels of expression of these molecules (52). More specifically, monocytic MDSCs are CD11b+ Ly6Glo Ly6Chi and granulocytic MDSCs are CD11b+ Ly6G+ Ly6Clo. In tumor models, monocytic MDSC populations have been described as F4/80int and granulocytic MDSCs as F4/80lo, thus distinguishing them from Gr-1− F4/80hi monocyte/macrophages (52). These MDSC subsets are thought to use different mechanisms to suppress T cell function (52). Compared with control mice, those given IL-33 exhibited increases in several CD11b- and F4/80-expressing subsets (Fig. 2A). CD11bhi F4/80−, CD11b+ F4/80int, and CD11blo F4/80hi cells were all increased substantially after IL-33 administration. CD11blo F4/80hi cells splenocytes from control mice were Ly6G/Clo and CD11chi, consistent with macrophages and mDCs (Fig. 2B). IL-33 administration promoted CD11blo F4/80hi cells, but also increased presumptive monocytes or DC precursors expressing CD11c and Ly6C (Fig. 2B). IL-33–treated mice also demonstrated a large increase in CD11bhi F4/80− splenocytes (Fig. 2A). Assessment of Ly6G/C and CD11c expression (Fig. 2B) revealed that these cells were very similar to those from PBS-treated mice, consisting of Ly6Ghi Ly6Cmod CD11c− cells. This phenotype is indicative of granulocytes and neutrophils and consistent with previous reports that IL-33 promotes their in vitro and in vivo expansion (2). A prominent population of CD11blo F4/80int cells was also increased profoundly after IL-33 administration (Fig. 2A). This population was composed of both Ly6G+ and Ly6C+ cells that differed from those in PBS-treated mice (Fig. 2B). Specifically, the CD11blo F4/80int cells in IL-33–treated mice displayed a greater proportion of Ly6G+ cells, but had prominent populations of Ly6G+/Ly6C+ and Ly6G−/Ly6C+ cells (Fig. 2B), potentially granulocytic or monocytic MDSCs, respectively. Thus, IL-33 administration modulates splenic myeloid populations favoring the expansion of CD11b+ CD11c− F4/80int Ly6G+ and Ly6C+ cells, a phenotype associated with MDSCs (52). IL-33 preferentially expands CD11b+ F4/80int cells containing Ly6G+ and Ly6C+ populations that potently inhibit allogeneic T cell responses. IL-33 facilitates the expansion of several CD11b and F4/80 expressing cell populations in the spleen. A, Flow cytometry plots, representative of at least three experiments performed, depict CD45+-gated total splenocytes from IL-33–treated or PBS-treated WT BALB/c mice. B, Panels present the incidence of Ly6G+ and Ly6C+ cells in CD11blo F4/80hi (top panels), CD11b+ F4/80int (middle panels), and CD11bhi F4/80− gated cells. Data are representative of more than three experiments performed. C, Ly6G or Ly6C cells were enriched from splenocytes pooled from each treatment group (n = 2 mice per group) and tested as suppressors (1:1) of purified B6 CD3+ T cell responders in MLR using CD11c+ BALB/c splenocytes (1:5) as stimulators. Data are from one experiment representative of three performed and are plotted as mean percent suppression + 1 SD and significance of differences determined by Student t test. *p < 0.05 (versus T cells + stimulators only or versus T cells and CD11c+ APCs only), #p < 0.05 (versus PBS group), †p < 0.05 (versus IL-33 group). The cpm measured for wells containing T cells only was 189 ± 125 and for those with T cells and CD11c+ stimulators was 9823 ± 2684. The cpm for MLR containing indicated Ly6C or Ly6G enriched suppressors were as follows: PBS Ly6G (9181 ± 1434), IL-33 Ly6G (3197 ± 47), Flt3L Ly6G (3157 ± 528), PBS Ly6C (6934 ± 601), IL-33 Ly6C (2637 ± 199), and Flt3L Ly6C (834 ± 79). Flt3L is known to expand MDSCs (51, 54, 55). To establish whether IL-33 could expand functional MDSCs, the two Gr-1–expressing populations, Ly6G+ and Ly6C+ cells, were enriched (Supplemental Fig. 3) from control, IL-33–treated, or Flt3L-treated BALB/c mice and assessed for their capacity to inhibit BALB/c CD11c+ splenocyte-induced proliferation of CD3+ allogeneic T cells (Fig. 2C). Both Ly6G- and Ly6C-expressing populations from IL-33–treated or Flt3L-treated mice potently suppressed T cell responses compared with the minimal suppression exhibited by those from control mice (Fig. 2C). In total, these data indicate that IL-33 administration increases CD11b+ Gr-1+, particularly Gr-1int cells with potent T cell suppressive capacity. The influence of IL-33 on lymphocyte populations was assessed 24 h after 10-d treatment of BALB/c and B6 mice with IL-33. IL-33 facilitates Th2 responses (56), and ST2L is a proposed marker of Th2 but not Th1 cell polarization (9). This is consistent with the significant enhancement of ST2L expression on both B6 and BALB/c CD4+ T cells after IL-33 administration (Fig. 3A, 3C, 3E). When the influence of IL-33 on CD4+ Foxp3+ cells was assessed, a previously unreported augmentation of both the incidence (Fig. 3A, 3C) and overall number of CD4+ Foxp3+ cells was observed (data not shown). This effect was dependent on ST2L expression, as it was not observed in St2−/− mice (Fig. 3B). It also did not depend on the presence of mast cells (Supplemental Fig. 4). It has been demonstrated recently that administration of Flt3L, which, like IL-33, expands CD11c+ and CD11b+ cells, also expands Foxp3+ Tregs (57). When compared directly, IL-33 exhibited a similar capacity to increase the frequency (Fig. 3C) and absolute number (data not shown) of CD4+ Foxp3+ cells to that of Flt3L. Upon further examination, we also found that a prominent subset of CD4+ Foxp3+ cells in IL-33–treated mice that expressed ST2L, or membrane-bound ST2 (Fig. 3A, 3C, 3D, 3E). Notably, the largest subset of CD4+ CD25+ cells in PBS-treated mice cells was Foxp3+ and ST2L+ (Fig. 3D), indicating that a significant proportion (40–50%) of naturally occurring regulatory T cells (nTregs) are ST2L+. Viable Foxp3+ cells were isolated by FACS from PBS-treated or IL-33–treated FIR mice and assessed for their capacity to suppress T cell proliferation. Both CD4+ Foxp3+ ST2L− and CD4+ Foxp3+ ST2L+ cells from IL-33–treated mice demonstrated suppressive activity (Fig. 3F). ST2L+ Foxp3+ cells from PBS-treated mice were similarly suppressive (data not shown). Thus, these data identify a previously unreported capacity of IL-33 to expand suppressive CD4+ Foxp3+ T cells in vivo. Likewise, our data reveal that ST2L, in addition to being expressed on Th2 cells (9), is found on an IL-33–expanded subset of suppressive nTregs. St2-dependent increase in suppressive CD4+ Foxp3+ cells, including a prominent ST2L+ subset, after IL-33 administration. IL-33–treated mice display an St2-dependent increase in splenic Foxp3+ CD4+ cells. A and B, Flow cytometric analysis of surface ST2L or intracellular Foxp3 expression by WT BALB/c St2+/+ (A) or BALB/c St2−/− (B) CD4+ T cells after treatment with PBS or IL-33 (0.5 μg/d: day 0 to day 10). Data depict the percentage of CD45+ CD3+ CD4+-gated cells expressing ST2L and intracellular Foxp3 on day 11. Flow cytometric plots are from one experiment representative of three performed. C, Mean incidence for the indicated population after IL-33 (0.5 μg/d: day 0 to day 10) or Flt3L (10 μg/d: day 0 to day 10) administration to WT BALB/c mice. Data are from one experiment (n = 2 to 3 mice per group) that is representative of three performed. Error bars indicate mean + 1 SD. *p < 0.05 (Student t test). D, Coexpression of ST2L by BALB/c splenic CD4+ CD25+ T cells. Data represent the percentage of splenic CD45+ CD3+ CD4+-gated cells expressing CD25+ (left panels) and CD4+ CD25+-gated (right panels) cells expressing ST2L and intracellular Foxp3 on day 11 after PBS or IL-33 treatment. Representative flow cytometric plots from one experiment representative of four performed. 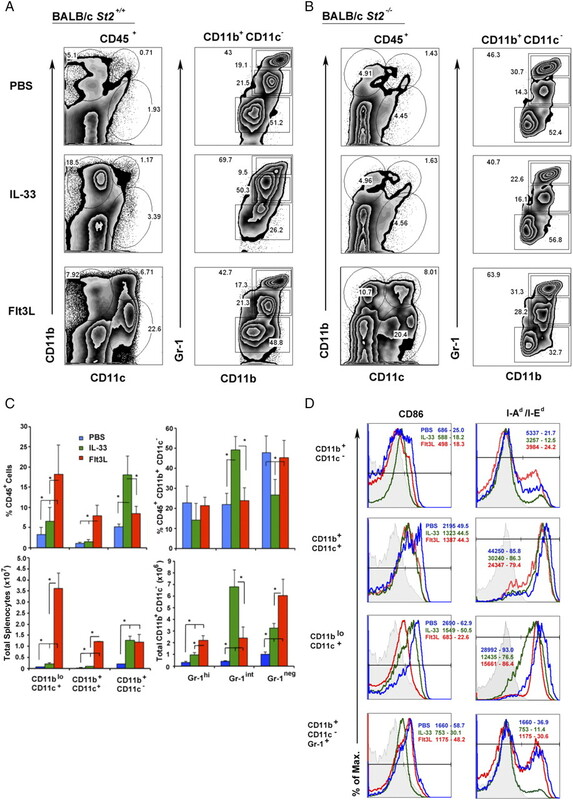 E and F, IL-33 expands B6 CD4+ Foxp3+ ST2L+ and STL2− T cells displaying suppressive capacity. E, Flow cytometric analysis of B6 splenic CD3+ CD4+ T cells after treatment with PBS or IL-33 as above. Data depict the percentage of CD45+ CD3+ CD4+-gated cells and are representative of three independent experiments performed. F, FACS was used to isolated viable ST2L− and ST2L+ CD4+ Foxp3+ (RFP+) cells from PBS-treated or IL-33–treated B6 Foxp3-reporter mice. Graded numbers of Foxp3+ (RFP+) cells were assessed for their capacity to suppress CD3/CD28-stimulated proliferation of CFSE-labeled B6 CD4+ CD25− T cells. Data depict the Foxp3− CD4+-gated cell proliferation profile, percent divided, and division index as calculated via FlowJo Proliferation Platform. Data are from one experiment representative of two performed. As described above, St2 gene products, particularly ST2L, are increased in cardiac hypertrophy and, with IL-33, may limit cardiovascular pathology (8, 58). Using an mAb detecting both sST2 and ST2L, we examined whether mouse cardiac allografts displayed modulation of ST2 by Qdot-based immunostaining of cryostat sections and observed profound upregulation of ST2 expression during rejection (Fig. 4). Specifically, 10 d after their transplantation into unmanipulated BALB/c recipients, B6 cardiac allografts exhibited strongly ST2+ myocardium and CD31+ endothelium (Fig. 4). This contrasted with normal B6 hearts and with BALB/c recipient native hearts, both of which stained only weakly for ST2 in the myocardium and did not express ST2 on CD31+ endothelium (Fig. 4). Thus, upregulated ST2 in rejecting grafts is consistent with the reported upregulation of ST2 during vascular pathology and suggests a potential target by which IL-33 may facilitate cardiac allograft survival. Increased endothelial and myocardial cell expression of ST2 during acute allograft rejection. Cryostat sections from naive B6 hearts, acutely rejected B6 hearts (day 10 after transplantation into BALB/c recipients), and BALB/c recipients’ native hearts were labeled with primary Abs to CD31 (red) or ST2 (green) that were then visualized with Qdot-conjugated secondary Abs. After nuclear staining with DAPI (blue), slides were scanned with a Mirax MIDI (3D Histech) and digital images generated with Panoramic Viewer (Version 1.14; 3D Histech). Images from a normal B6 and transplanted and native hearts from two representative graft recipients are presented at magnifications of ×1 (left panels), ×5 (right panels), and ×40 (insets). To determine the influence of IL-33 and ST2 on cardiac allograft survival, groups of WT or St2−/− BALB/c mice were given heterotopic B6 heart transplants (day 0) and either remained untreated or received IL-33 (0.5 μg i.p. on days 0, 1, 3, 6, 10, 13, 15, and 17). Allografts harvested from WT BALB/c recipients treated with IL-33 exhibited markedly reduced mononuclear cell infiltration and greater areas of normal myocardium (Fig. 5A, 5B). 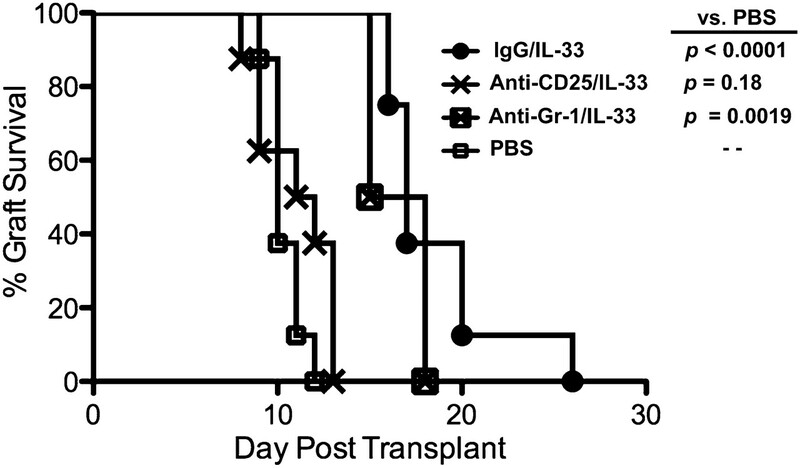 IL-33–treated mouse grafts were also less infiltrated by CD3+ T cells (Fig. 5C). Likewise, B6 allografts in WT BALB/c mice treated with IL-33 survived significantly longer (mean survival time [MST] = 29 d versus MST = 9 d for control recipients; p < 0.0001; Fig. 5D). However, BALB/c St2−/− recipient mice, which lack functional IL-33R due to the absence of ST2L, did not display any change in graft survival compared with controls (MST = 11 d; Fig. 5D). Thus, although heart grafts display upregulated ST2 expression, the therapeutic effect of IL-33 required St2 expression by the recipient. Prolongation of cardiac allograft survival by IL-33 is dependent on host St2 expression. B6 heart survival is prolonged by IL-33 in WT, but not St2−/− BALB/c recipients. BALB/c (St2+/+ and St2−/−) mice received heterotopic heart transplants and postoperative monotherapy of IL-33 (0.5 μg/d i.p. on days 0, 1, 3, 6, 10, 13, 15, and 17). A and B, On day 10 posttransplant, heart grafts from WT BALB/c mice treated with IL-33 displayed markedly reduced infiltrates of mononuclear cells in the myocardial interstitium and preserved tissue architecture compared with control mice receiving PBS. Data are from two animals representative of four in each group. H&E staining. Original magnification ×20 (A) and ×40 (B). C, Less CD3+ cell infiltrate is observed in IL-33–treated grafts. Data are anti-CD3 immunohistochemical staining of frozen material from one animal per condition and representative of the group (n = 4). D, In St2+/+ but not St2−/− recipients, IL-33 significantly increased allograft survival (n = 5 to 8 per group). Administration of IL-33 has been associated with enhanced systemic Th2 cytokine levels and the functional activation of ST2L-expressing cells, including Th2 cells, basophils, mast cells, and eosinophils (2). Consistent with these observations, IL-33 treatment after cardiac transplantation significantly increased serum levels of IL-5 and IL-13 compared with those of naive BALB/c mice and control graft recipients (Fig. 6A). IL-33 administration also led to a significant decrease in circulating IL-6. Although there was a trend toward increased IL-4 and decreased IFN-γ levels in the circulation, the difference between IL-33–treated and control mice was not significant (Fig. 6A). There was also no significant difference, at day 11 posttransplant, in systemic CD4+ cell expression of IL-4 or IFN-γ determined by flow cytometry (Fig. 6B) or ELISPOT analysis (data not shown). However, increases in alloreactive CD4+ IL-5+ cells in IL-33–treated animals were detected (Fig. 6C). A significant reduction in the incidence of splenic CD3+ CD8+ and CD8+ IFN-γ+ T cells was also observed (Fig. 6D, 6E). Notably, although splenic numbers of CD4+ Foxp3+ T cells did not differ between control and IL-33–treated allograft recipients (Fig. 6B), transplants from IL-33–treated animals displayed a marked increase in Foxp3+ cells (Fig. 6F). This increase was evident despite the overall decrease in graft-infiltrating cells, including CD3+ T cells (Figs. 5A–C, Fig. 6F). A trend toward increased ST2+ cells was also observed in IL-33–treated grafts, although differences between PBS-treated and IL-33–treated grafts did not reach significance. Overall, IL-33 administration facilitated increased Th2-type cellular and systemic responses and increased Foxp3+ cells within cardiac allografts. IL-33–treated allograft recipients display a Th2-type systemic response and increased intragraft Foxp3+ cells. A, Significantly decreased IL-6 and markedly increased circulating IL-5 and IL-13 levels observed in IL-33 recipients. The indicated serum cytokines were measured by Luminex assay on day 11 after transplantation of B6 hearts into WT BALB/c hosts, which also received PBS or IL-33 as described in the legend to Fig. 5. Comparison with normal B6 serum is also shown. Fibroblast growth factor, GM-CSF, IL-1α/β, IL-2, IL-17, CXCL1, MIP-1α, TNF-α, and VEGF were not detected or significantly altered from normal levels. Data shown are the means + 1 SD. n = 3 to 4 mice per group. *p < 0.05 (Student t test). B, After their isolation on day 11 from BALB/c mice given B6 heart transplants alone (PBS) or with IL-33 monotherapy, splenocytes were stained and assessed by flow cytometry after stimulation with PMA/ionomycin in the presence of GolgiPlug. The graph depicts mean percent CD45+ cells + 1 SD for cells in the indicated gate. n = 2 to 3 per group. *p < 0.05 (Student t test). C, Also on day 11, splenic CD4+ cells were purified from BALB/c mice given B6 heart transplants alone (control PBS treatment) or with IL-33 monotherapy. The frequency of directly reactive CD4+ IL-5–secreting T cells was determined 3 d after stimulation with CD3-depleted BALB/c (donor) or C3H (third party) splenocytes. Data are group means + SD, with n = 3/group. *p < 0.05 (Student t test). D and E, Assessment of splenic CD45+ CD8+ T cells in IL-33–treated versus control heart graft recipients revealed reduced incidences of CD3+ CD8+ T cells, particularly CD8+ IFN+ cells. D, Representative flow plots from one animal representative of the three analyzed. E, Graph depicts mean percent CD45+ cells + 1 SD for cells contained in the indicated gate. n = 3/group. *p < 0.05 (Student t test). F, Confocal analysis of staining for ST2 (red), Foxp3 (green), and Hoechst (blue) demonstrate that heart grafts from IL-33–treated recipients had increased Foxp3+ cells. The graph presents the mean number + 1 SD of Foxp3+ cells per ×40 field for each condition. Positive cells in five randomly selected ×40 fields from four individuals per group were quantified through use of the Image-based Tool for Counting Nuclei and ImageJ software. *p < 0.05 (Student t test). Given our findings that IL-33 promoted the expansion of CD11b+ Gr-1int cells comprising Ly6G+ and Ly6C+ populations with the ability to suppress allogeneic T cell proliferation (Fig. 2C), we assessed whether IL-33 administration could promote a similar effect after cardiac transplantation. Both control and IL-33–treated graft recipients displayed an increase in splenic CD11b+ cells compared with naive BALB/c mice (Fig. 7A). However, whereas control graft recipients displayed a significant increase in the incidence of CD11b+ Gr-1hi cells (Fig. 7A, 7B), IL-33–treated hosts displayed large increases in Gr-1int cells among CD11b+ cells (Fig. 7A, 7B, 7D). As such, whereas both control and IL-33–treated graft recipients exhibited a significant increase in the overall numbers of splenic CD45+ CD11b+ cells (Fig. 7A, 7C) compared with those of naive BALB/c mice, IL-33–treated animals displayed significant increases in CD11b+ Gr-1int cells compared with those of both naive and control graft recipients (Fig. 7A, 7B, 7D). Thus, both when given to normal mice and after cardiac transplantation, IL-33 modulates myeloid populations to enrich for CD11b+ Gr-1int cells. IL-33 monotherapy profoundly alters CD11b+ populations in cardiac transplant recipients, favoring Gr-1int-expressing cells. Administration of IL-33 after heart transplantation promotes increased incidences of CD11b+ F4/80lo Gr-1int cells. On day 11, spleen cells from BALB/c mice given B6 heart grafts alone or with IL-33 monotherapy were compared by flow cytometry with normal animals or heart graft recipients receiving only PBS. A, The left panels depict the incidence of total CD45+ cells, and the right panels indicate the incidence of those from the CD11b+ CD11c− gate. Data are representative flow plots from one animal representative of the three to four assessed for each group. B, Data represent the mean frequency of the indicated population in CD45+ CD11b+ CD11c− gated cells (n = 3 to 4 per group). Error bars indicate 1 SD. *p < 0.05 (Student t test). C and D, IL-33 increases the number of splenic CD11b+ CD11clo F4/80lo Gr-1int cells. Data indicate the calculated total splenic numbers for the indicated populations (n = 3 to 4 per group). Error bars indicate 1 SD. *p < 0.05 (Student t test). To define whether IL-33–mediated prolongation of allograft survival depended on the presence of nTregs or MDSCs, BALB/c recipients were administered Abs established to selectively deplete these populations before B6 heart transplantation and subsequent IL-33 administration. IL-33 prolonged cardiac allograft survival significantly in mice treated with IgG or anti–Gr-1 mAb (Fig. 8). However, graft recipients depleted of CD25+ nTregs via anti-CD25 mAb administration displayed no therapeutic benefit from IL-33 administration (Fig. 8). Specifically, nTreg-depleted recipients displayed graft survival comparable with that of BALB/c recipients receiving no mAb and only PBS (Fig. 8). Thus, these data demonstrate the critical importance of nTregs, but not MDSCs, in the capacity of IL-33 to promote cardiac allograft survival. Depletion of CD25+ Tregs, but not Gr-1+ cells, before transplantation prevents prolongation of cardiac allograft survival by IL-33. Groups of WT BALB/c mice received anti-CD25 Ab to deplete CD4+ CD25+ Tregs (n = 8), anti–Gr-1 Ab to deplete Gr-1+ myeloid cells (n = 4), or rat polyclonal IgG (n = 8) before receiving a B6 heterotopic heart transplant and IL-33 monotherapy as above. As a control, a fourth group received PBS only after transplantation (n = 8). To our knowledge, we show for the first time that administering IL-33 to normal or heart-allografted mice facilitates myeloid APC expansion, including immature CD11blo CD11c+ DCs and to a greater extent suppressive CD11b+ Gr-1int MDSCs. Furthermore, we report the novel finding that IL-33 has the capacity to expand functional CD4+ Foxp3+ Tregs, which mediate the capacity of IL-33 to promote cardiac allograft survival. Our findings thus broaden the range of in vivo immunoregulatory properties of IL-33. Excluding limited studies on peritoneal macrophages, the in vivo influence of IL-33 on myeloid APCs is poorly understood. IL-33 has been found to be similar to other hematopoietic growth factors, including GM-CSF or Flt3L, in its ability to sustain cell survival and promote CD11c+ mDC generation in BM culture (29). In these studies, IL-33 did not appear proinflammatory, as mDCs generated in IL-33 expressed little MHC or costimulatory molecules, but increased their PD-L1 and PD-L2 expression. IL-33–generated mDCs were poorly stimulatory and also displayed little TLR-induced upregulation of CD86 or proinflammatory cytokines. In this study, we now demonstrate that IL-33 expands CD11blo CD11c+ DCs in vivo. However, whereas IL-33 displays similar capacity to Flt3L to expand mDCs in vitro (29), Flt3L is a more potent facilitator of CD11blo CD11c+ and CD11bhi CD11c+ DC expansion in vivo. Consistent with the foregoing observation (29) that IL-33 expands poorly stimulatory DCs ex vivo, we show that CD11blo CD11c+ cells from IL-33–treated animals display decreased MHC class II and CD86. We did not observe increased plasmacytoid DCs (CD11b− CD11clo B220+) after IL-33 administration (data not shown). Thus, both in vivo and ex vivo, IL-33 expands CD11blo CD11c+ mDCs. In addition to CD11blo CD11c+ cells, we found that IL-33 mediates a previously unreported capacity to expand CD11b+ CD11c− Gr-1+ cells in vitro and in vivo. Given the growing consensus that CD11b+ Gr-1+ MSDCs play a major role in cancer progression (51, 52, 59) and the importance attributed to MSDCs in tolerance induction (44, 60), these cells have emerged as an immunoregulatory population of great interest. In the current studies, IL-33 preferentially expanded CD11b+ CD11clo F4/80int Gr-1int cells compared with PBS or Flt3L treatment of mice. Both Ly6G+ and Ly6C+ suppressive CD11b+ cells were evident in the IL-33–treated animals. Across multiple tumor models, it is the CD11b+ Gr-1int population of MDSCs that consistently exhibits in vitro and in vivo suppressive capacity (61). Eosinophils (CD11b+ Ly6C+ Ly6G+ F4/80lo) are expanded by IL-33 administration (1), but do not suppress T cell proliferation (61). Furthermore, although IL-33 stimulates mast cells, and these have been implicated in mobilization of MDSCs during tumor development (62), our data suggest that mast cells do not mediate IL-33–induced expansion of CD11b+ Gr-1int cells, as they were still greatly increased after IL-33 treatment of mast cell-deficient mice. High-dose GM-CSF subverts immune reactivity by increasing MDSCs (63). Likewise, Flt3L administration increases MDSCs in vivo (51, 54), and spleen cells from Flt3L-treated animals can induce tolerance across MHC barriers (64). Our findings provide new evidence that both Flt3L and IL-33 expand Ly6G+ and Ly6C+ cells with the capacity to suppress alloreactive T cells. However, it is currently unclear how IL-33 acts to promote several distinct myeloid cell populations. Potentially, by stimulating BM cell GM-CSF production (29, 65), IL-33 can act indirectly to promote mobilization of myeloid precursors. However, our current data demonstrate that IL-33 administration also facilitates immature mDCs and MDSCs in vivo. Likewise, we find that IL-33–stimulated BM cell cultures display expansion of immature mDCs, as previously observed (29), and also CD11b+ Gr-1+ cells. Notably, our data also show that addition of IL-33 to GM-CSF plus IL-4–stimulated cultures also generates mDCs with reduced maturity and resistance to proinflammatory stimuli. Thus, IL-33 also may also impede full myeloid cell differentiation. As discussed earlier, MSDCs have been established as mediators of immune tolerance (44, 60), and we find IL-33 administration greatly increases splenic CD11b+ Gr-1int MDSCs in normal and transplanted mice. However, depletion of Gr-1+ cells prior to transplantation and IL-33 administration did not impede the capacity of IL-33 to prolong cardiac allograft survival. 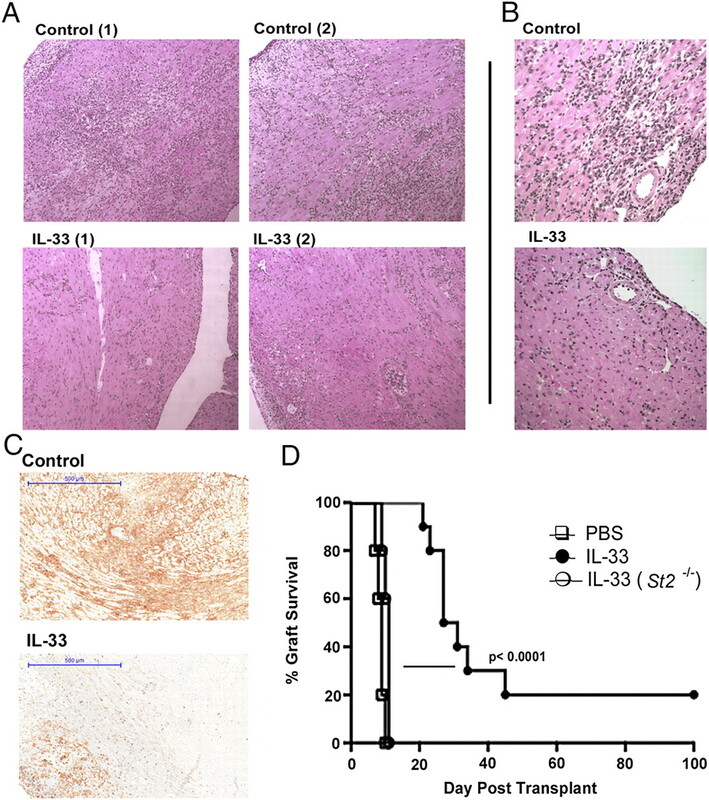 Thus, although this is a newly identified immunoregulatory capacity of IL-33, it does not appear to underlie the capacity of IL-33 to suppress acute allograft rejection. It has been suggested that IL-33 prolongs cardiac allograft survival by promoting Th2 responses (33). We find that administration of IL-33 concurrent with cardiac allotransplantation increases systemic levels of IL-5 and IL-13, increases IL-5+ CD4+ cells, and decreases CD8+ IFN-γ+ T cells. Reduction of intragraft IFN-γ by systemic neutralization of IL-12, and concomitant increases in IL-4 and IL-10, inhibit indirect T cell responses (to alloantigen presented by recipient DCs on self MHC) resulting in prolonged allograft survival across minor Ag mismatches, but not full MHC barriers (34). Thus, there is some support for Th2 cytokine-mediated prolongation of graft survival. However, there is also evidence that IL-4 and Th2 cytokines can promote graft rejection and dysfunction (35). In particular, IL-5–secreting CD4+ T cells and eosinophils promote rejection of fully MHC-mismatched heart allografts in recipients depleted of CD8+ T cells (66). Also, whereas IL-4 and IL-13 are necessary for neonatal tolerance (67), they are not required for transplant tolerance in adult animals (68). Notably, IL-13 is implicated in tolerance, particularly by targeting myeloid cells (69) and activating the suppressive function of MDSCs (13, 51). Thus, although MDSCs do not appear fundamental to IL-33 protection of cardiac allografts, the role of IL-13 in IL-33–mediated increases in functional MDSCs and poorly stimulatory mDCs warrants further examination. Most consistent with the capacity of IL-33 to prolong cardiac allograft survival is our demonstration of its capacity to increase suppressive CD4+ Foxp3+ cells, including a prominent ST2L+ subset. Heart grafts from IL-33–treated animals have increased Foxp3+ cells compared with those from control animals, and depletion of nTregs from recipients prior to transplantation ablated any therapeutic benefit of IL-33 monotherapy. From our findings, it follows that, although IL-33 supports Th2 responses, it targets nTregs to mediate protection of cardiac allografts during acute rejection. To date, the impact of IL-33 has focused mainly on CD4+ Th2 cells. Polarized Th2 cells express ST2L and migrate to IL-33, which stimulates their IL-5 and IL-13 expression (1, 12). Th2 polarization in the presence of Ag and IL-33 results in Th2 cells that express IL-5, but not IL-4 (31). We now demonstrate that a significant subset (40–50%) of CD4+ CD25+ nTregs express ST2L, the membrane-bound form of ST2, and both ST2L+ and ST2L− CD4+ Foxp3+ are significantly expanded by IL-33. 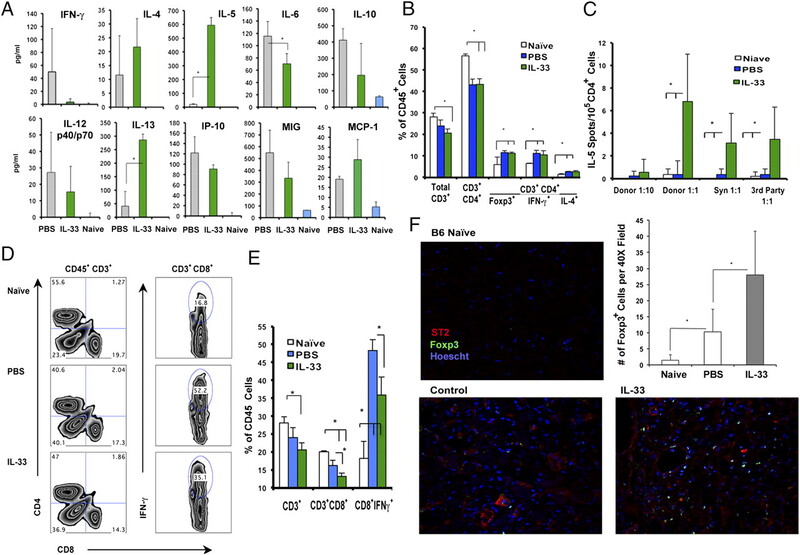 CD4+ Foxp3+ cells from IL-33–treated mice exhibited suppressive capacity, thus, IL-33 not only supports the induction of Th2 responses but also mediates the capacity to expand functional Foxp3+ Tregs. Numerous transplant models have shown the importance of nTregs in limiting alloreactivity and supporting tolerance-inducing regimens (42, 70). It has been proposed that Tregs may traffic to the graft site and inhibit inflammatory responses (42), although definitive evidence for this mechanism is lacking. It is well understood that Tregs can directly suppress CD4+ and CD8+ T cell function, or indirectly through their actions on DC/APC function (42, 70). It will be of interest to establish the environment in which IL-33–expanded CD4+ Foxp3+ cells mediate their protective role. Likewise, future study is warranted to establish if nTregs, which mediate IL-33 protection of cardiac allografts, are expanded directly via their expressed ST2L or indirectly through interaction with IL-33–influenced mDCs and/or MDSCs. Finally, our findings indicate that the therapeutic effect of IL-33 in cardiac transplantation is dependent on recipient expression of ST2, presumably ST2L on recipient nTregs. This was despite increased ST2 detected in rejecting graft endothelium and myocytes. Thus, graft expression of ST2, potentially including ST2L on the endothelium, is not necessary for IL-33–mediated prolongation of cardiac allograft survival in a completely MHC-mismatched model. However, it will be important to further investigate the function of cardiac graft ST2 expression in models of chronic heart allograft rejection. In summary, our data show that, in addition to facilitating Th2 responses, IL-33 expands functional MDSCs and suppressive CD4+ Foxp3+ Tregs, including those expressing ST2L. Importantly, we also establish that the prolongation of cardiac allograft survival by IL-33 requires recipient Tregs. As such, these findings reveal previously undefined functions of this IL-1 family member and identify a specific mechanism whereby IL-33 targets recipient nTregs to prolong organ allograft survival. We acknowledge Lisa Mathews for excellent technical assistance and Miriam Freeman for assistance in manuscript preparation. We also acknowledge Dr. Giorgio Raimondi for valuable advice on completion of the bead-based Treg suppression assay. This work was supported by National Institutes of Health Grants R01 AI60994 and P01 AI81678 (to A.W.T.). B.R.R. was supported by National Institutes of Health Training Grant T32 AI74490 and by an American Heart Association predoctoral fellowship (7070020). A.C. was supported by a Basic Science fellowship from the American Society of Transplantation and a Sunflowers for Holli fellowship from the American Liver Foundation. This work was also supported by a National Institutes of Health Pathway-to-Independence Career Development award (K99/R00 HL97155) and a Starzl Transplantation Institute Young Investigator grant (to H.R.T.).
. 2010. mTOR and GSK-3 shape the CD4+ T-cell stimulatory and differentiation capacity of myeloid DCs after exposure to LPS. Blood 115: 4758–4769.
. 1998. Selective expression of a stable cell surface molecule on type 2 but not type 1 helper T cells. J. Exp. Med. 187: 787–794.
. 1994. Alternative promoter usage of the Fos-responsive gene Fit-1 generates mRNA isoforms coding for either secreted or membrane-bound proteins related to the IL-1 receptor. EMBO J. 13: 1176–1188.
. 2007. IgE- and FcepsilonRI-mediated enhancement of surface CD69 expression in basophils: role of low-level stimulation. Int. Arch. Allergy Immunol. 143(Suppl 1): 56–59.
. 2009. Human basophils and eosinophils are the direct target leukocytes of the novel IL-1 family member IL-33. Blood 113: 1526–1534.
. 2010. IL-33 is a crucial amplifier of innate rather than acquired immunity. Proc. Natl. Acad. Sci. USA 107: 18581–18586.
. 2010. Interleukin-33 attenuates sepsis by enhancing neutrophil influx to the site of infection. Nat. Med. 16: 708–712.
. 2009. The pro-Th2 cytokine IL-33 directly interacts with invariant NKT and NK cells to induce IFN-gamma production. Eur. J. Immunol. 39: 1046–1055.
. 2010. The enigmatic processing and secretion of interleukin-33. Cell. Mol. Immunol. 7: 260–262.
. 2008. IL-1beta-driven ST2L expression promotes maturation resistance in rapamycin-conditioned dendritic cells. J. Immunol. 181: 62–72.
. 2009. IL-33 promotes DC development in BM culture by triggering GM-CSF production. Eur. J. Immunol. 39: 3331–3342.
. 2008. IL-33 exacerbates antigen-induced arthritis by activating mast cells. Proc. Natl. Acad. Sci. USA 105: 10913–10918.
. 2008. IL-33 induces antigen-specific IL-5+ T cells and promotes allergic-induced airway inflammation independent of IL-4. J. Immunol. 181: 4780–4790.
. 2010. IL-33 prolongs murine cardiac allograft survival through induction of TH2-type immune deviation. Transplantation 89: 1189–1197.
. 1998. On histocompatibility barriers, Th1 to Th2 immune deviation, and the nature of the allograft responses. J. Immunol. 161: 2241–2247.
. 2009. Role of IL-4 and Th2 responses in allograft rejection and tolerance. Curr. Opin. Organ Transplant. 14: 16–22.
. 2010. A novel chemoimmunomodulating property of docetaxel: suppression of myeloid-derived suppressor cells in tumor bearers. Clin. Cancer Res. 16: 4583–4594.
. 2007. Rapamycin-conditioned dendritic cells are poor stimulators of allogeneic CD4+ T cells, but enrich for antigen-specific Foxp3+ T regulatory cells and promote organ transplant tolerance. J. Immunol. 178: 7018–7031.
. 1996. Costimulatory molecule-deficient dendritic cell progenitors (MHC class II+, CD80dim, CD86-) prolong cardiac allograft survival in nonimmunosuppressed recipients. Transplantation 62: 659–665.
. 2005. Analysis of the underlying cellular mechanisms of anti-CD154-induced graft tolerance: the interplay of clonal anergy and immune regulation. J. Immunol. 175: 771–779.
. 2003. Regulatory T cells in transplantation tolerance. Nat. Rev. Immunol. 3: 199–210.
. 2005. Regulatory T cells suppress CD8+ T cell responses induced by direct priming and cross-priming and moderate immunodominance disparities. J. Immunol. 174: 3344–3351.
. 2005. CXCL9 antagonism further extends prolonged cardiac allograft survival in CCL19/CCL21-deficient mice. Am. J. Transplant. 5: 2104–2113.
. 2010. Adding value to liver (and allograft) biopsy evaluation using a combination of multiplex quantum dot immunostaining, high-resolution whole-slide digital imaging, and automated image analysis. Clin. Liver Dis. 14: 669–685.
. 2009. Myeloid-derived suppressor cell activation by combined LPS and IFN-gamma treatment impairs DC development. Eur. J. Immunol. 39: 2865–2876.
. 1996. Dramatic increase in the numbers of functionally mature dendritic cells in Flt3 ligand-treated mice: multiple dendritic cell subpopulations identified. J. Exp. Med. 184: 1953–1962.
. 1979. Decreased production of mast cells in S1/S1d anemic mice. Blood 53: 492–497.
. 2007. Spleen but not tumor infiltration by dendritic and T cells is increased by intravenous adenovirus-Flt3 ligand injection. Cancer Gene Ther. 14: 364–371.
. 2001. Inhibition of T1/ST2 during respiratory syncytial virus infection prevents T helper cell type 2 (Th2)- but not Th1-driven immunopathology. J. Exp. Med. 193: 785–792.
. 2009. Expansion of peripheral naturally occurring T regulatory cells by Fms-like tyrosine kinase 3 ligand treatment. Blood 113: 6277–6287.
. 2010. Hierarchy of immunosuppressive strength among myeloid-derived suppressor cell subsets is determined by GM-CSF. Eur. J. Immunol. 40: 22–35.
. 2010. Mast cells mobilize myeloid-derived suppressor cells and Treg cells in tumor microenvironment via IL-17 pathway in murine hepatocarcinoma model. PLoS ONE 5: e8922.
. 2002. Promotion of skin graft tolerance across MHC barriers by mobilization of dendritic cells in donor hemopoietic cell infusions. J. Immunol. 169: 2390–2396.
. 2009. IL-33 activates unprimed murine basophils directly in vitro and induces their in vivo expansion indirectly by promoting hematopoietic growth factor production. J. Immunol. 183: 3591–3597.
. 2000. IL-5 and eosinophils mediate the rejection of fully histoincompatible vascularized cardiac allografts: regulatory role of alloreactive CD8(+) T lymphocytes and IFN-gamma. Eur. J. Immunol. 30: 1290–1296.
. 2001. Failure to induce neonatal tolerance in mice that lack both IL-4 and IL-13 but not in those that lack IL-4 alone. J. Immunol. 167: 1125–1128.
. 1997. Blocking the CD28-B7 T cell costimulation pathway induces long term cardiac allograft acceptance in the absence of IL-4. J. Immunol. 158: 2443–2448.
. 2007. IL-13 prolongs allograft survival: association with inhibition of macrophage cytokine activation. Transpl. Immunol. 17: 178–186.
. 2010. An update on regulatory T cells in transplant tolerance and rejection. Nat. Rev. Nephrol. 6: 577–583.